The Australian rock band Midnight Oil kicked off its “The Great Circle 2017” World Tour where it began — in a small Sydney club. The group then played five dates in Brazil, where it also appeared aboard Greenpeace’s “The Rainbow Warrior.” With the release of three new box sets — Complete Vinyl Collection (all the studio LPs and EPs), Full Tank (all the CDs and music videos) and Overflow Tank — the band has plenty of product to promote. 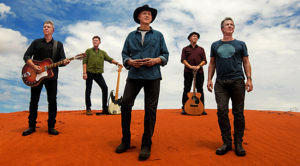 But, as guitarist Jim Moginie put it in a phone call from Spain where he was “having a break from the tour” and planning to “head down the road to hear some flamenco music,” the band’s revitalization has more to do with a sense of urgency that stems from a need to address the current political climate. How did you come to the decision to regroup and tour again? We signed on for another tour of active duty. We’re really enjoying it and it feels like a team effort. It’s good. You played in a band before Peter Garrett joined. What did he bring to the group that wasn’t there before? I was still in school. We decided to tour the north and south coast of New south Wales where there are these beautiful beaches with great surfing. We always thought we’d get a proper singer. Peter came and looked at us suspiciously like “Who are these guys?” He came and sang and I think we did “Locomotive Breath” by Jethro Tull and then a free form rant that used various Australian slang terms. We looked at each and said, “Let’s do it.” It was as simple as that. That’s how he got the gig. I don’t think he had a car but he had a PA. I discovered Midnight Oil via 10-1. Talk about the recording of that album, which took place in London. What did you try to do differently? It’s got a special place in my heart. We grew up in the pubs and clubs in Australia. We were making punk rock thrash records that were kind of brutal. The radio didn’t touch them, not that that was our priority. But as anyone in a band can tell you, it’s a lot easier if you have some support behind you. We had made some other records, which were great. This studio we went to was a townhouse in London with Nick Launay, who worked with XTC and Peter Gabriel. He was young — I think he was 22 — and full of ideas. We were like the lunatics running the asylum. We had to make that record very quickly. It did define our sound because we brought acoustic guitars in and combined it with big drum sounds and choruses and melodic sounds. It was a studio-made record but it embodied the ramshackle rock ‘n’ roll going out of control down the hill feel of the band playing live. In Chicago, we played the whole thing back to back. It was an interesting experience—a major flashback. What was it like to see Diesel and Dust become an international success? That album specifically refers to the treatment of the Aborigines in Australia. Why do you think that message resonated with such a wide audience? It’s an interesting question. We did music that had a message and was wrapped up with a good beat. We wanted to say things but to say them we had both things happening. That’s what makes a great band. We had a profound experience when you discover your country. We wanted to put down what we’d seen. It was pretty simple. We surprised it was taken on board by countries across the world. I think the artwork had something to do with it as well. What happened here was an invasion and they were killed and driven out and no one wanted to talk about it. We wanted to recognize what happened. It’s not in the history books, all the things that happened. It’s a “we forget” type of thing. Talk about what it was like to go through archives for the reissue of your back catalog. It’s funny. You see all the little notes and the smell of the tape is an aphrodisiac for a studio nerd like me. It was a blast. There were so many tapes and materials and notes. We also found a lot of stuff that was songs we didn’t put out, B-sides and live concerts. There was one in South Africa at Ellis Park. We didn’t even know it was filmed. We had a look at it and were like, “My God.” It was wonderful to discover those things. It helped us focus now. We realized the material we recorded was great but we were playing more of the hits. We went back and learned 170 songs to give people a deeper experience. That’s been reflected in the live sets. The archives have been part of rediscovering the music. Often when you’re in the middle of doing something, you don’t realize what you’ve got.